Recycle the shards of an old dinner plate by adding mosaic decoration to a flower pot! Mosaic pots made with old china. First, the fun part – take your dish, wrap it in the dish towel, and take the hammer to it! Break the dish with the side of the hammer, then check to see if the shapes are what you want and the flowers or patterns are showing; you want pieces that are not too small or two large. Being careful not to cut yourself, take one piece at a time and place your pieces in a bowl. Now glue the back of each piece and place onto the top, in separated areas – you must make sure the pieces do not touch so you can apply the grout. Let dry fully so that when you put on the grout the pieces wont fall off. When dry, place your grout all over. Try to keep it off the glass – but you are sure to get some of it on. If so, let dry about 5 minutes and whip off with a damp towel. Make sure you get all the grout off the glass. Let your flower pot dry. 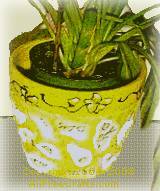 I painted the top of the flower pot as shown and I painted the design of the plate on the top. 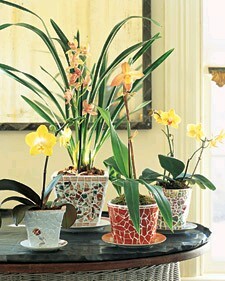 Martha Stewart has hints and tips on making the mosaic Patterned Pots with bits and pieces of china. 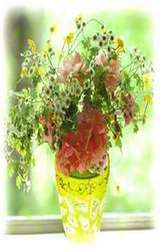 Mosaic Flower Pots and Vases 0001 by Recycle Artist on YouTube.